Go ahead guys, blather on about your brains. Soon enough, your hearts will show you who’s boss. This idea is made wonderfully clear in an exceptional production of “Love’s Labour’s Lost” by the Shakespeare Theater of New Jersey. 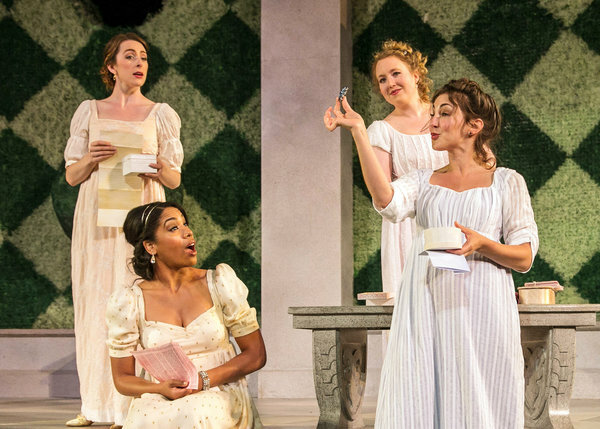 In the play, staged outdoors at the amphitheater on the campus of the College of St. Elizabeth in Morris Township, four would-be scholars vow to forsake virtually all diversions — the most prominent being the company of women — for three years as they devote themselves to academics. Ferdinand, King of Navarre (Jonathan Raviv), their leader, goes so far as to decree that no women will be allowed within a mile of his court, a plan that his colleagues Dumaine (Austin Ku), Longaville (Aaron McDaniel) and Berowne (Ben Jacoby) champion with varying degrees of enthusiasm. Though these men put on robes, you’ll wonder if they should be fitted for dunce caps for thinking that such a plan will succeed. And fail the plan does, quickly and most winningly, with the arrival of the Princess of France (Jesmille Darbouze) and her three ladies: Katherine (Kristen Kittel), Maria (Carrie Walsh) and Rosaline (Susan Maris). Romance blossoms between both groups despite the men’s oaths of celibacy. Intellect, after all, is powerless against passion. 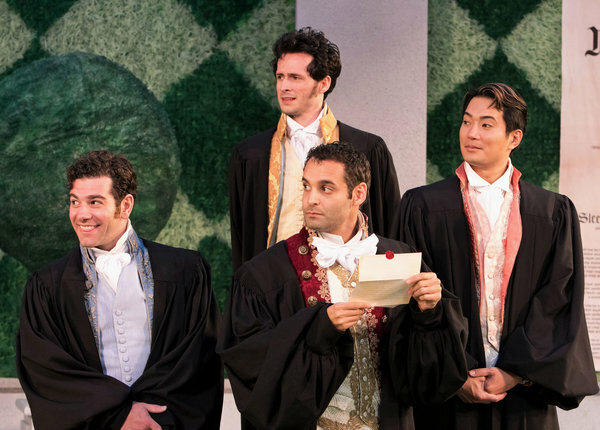 The play has all the hallmarks of a Shakespeare comedy: Letters are misdelivered, disguises are donned and secret soliloquies are overheard by others. There’s a show within the show, and a few fools to keep the humor high. And through it all is that wonderful wit: wordplay in which “Shakespeare seems to seek the limits of his verbal resources, and discovers that there are none,” to quote the scholar Harold Bloom. Perhaps partly for that reason, “Love’s Labour’s Lost” isn’t as widely produced as other Shakespeare comedies. It takes dexterous actors to master the script’s language and pacing — too wild and you’ll exhaust your audience, too slow and you’ll lose their attention. Less-than-confident line readings can doom a performance. No worries about that here. As directed by Brian B. Crowe, the cast speaks the speech so trippingly that it sounds extemporaneous. Small motions — the roll of an eye or the flick of a hand — punctuate the dialogue and make it even more crisp. Ms. Maris and Mr. Jacoby are especially capable, and impeccably paired as the story’s central couple. An early speech in which she recounts Berowne’s reputation is enchantingly delivered with starry eyes, while his later discourse on falling in love is a delight. In some productions, Berowne can be overplayed as a preening narcissist. Mr. Jacoby instead embodies a cheerful rascal who always has a ready smile. It’s a wise choice.